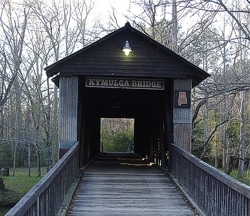 The Kymulga Grist Mill, Covered Bridge and Park are of significant historical, educational and recreational value. Located on Grist Mill Road four miles northeast of Childersburg, Alabama, the mill and bridge are over one hundred forty years old. Listed in the National Register of Historic Places, they are the only pair of such structures in Alabama that still stand where they were originally built on Talladega Creek. The adjacent park is home to a variety of animals and plants. Several large trees there have been judged by foresters to be older than the mill or bridge. 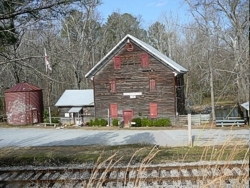 The grist mill serves as a focal point for attracting visitors to Talladega County and the State of Alabama. The preservation of this landmark is essential to insure its role as a major component of an important historical, educational and recreational site. Over the past two years, swift high waters in the creek during unusually heavy rains has caused serious damage of the foundation of the mill. There is an urgent need to make repairs before further damage is done. It will also be necessary to alter the flow of water to prevent a recurrence of the problem. Our mission is to fulfill these needs and maintain the upkeep of these historic landmarks.